RB Leipzig go to the top of the Bundesliga while Borussia Dortmund inflict FC Bayern München's first defeat of the season, all in our round-up of a thrilling Matchday 11. How did your Official Fantasy Bundesliga side fare on Matchday 11? Find out here! Two inspired substitutions helped Frankfurt turn the tables on lowly Bremen in Matchday 11's closing fixture. After Florian Grillitsch had given the Green-Whites a first-half lead, Alexander Meier stepped off the bench to level matters with only his second touch of the ball 11 minutes into the second period. Returning Bremen striker Claudio Pizarro forced a stunning save from Lukas Hradecky, before 18-year-old Bundesliga debutant Aymane Barkok curled home a dramatic winner in the final minute of normal time to send the Eagles home with the points. An exceptional Dortmund display that oozed pizzazz and pluck in equal measure contributed to another spellbinding edition of Der Klassiker at the sold-out SIGNAL IDUNA PARK. 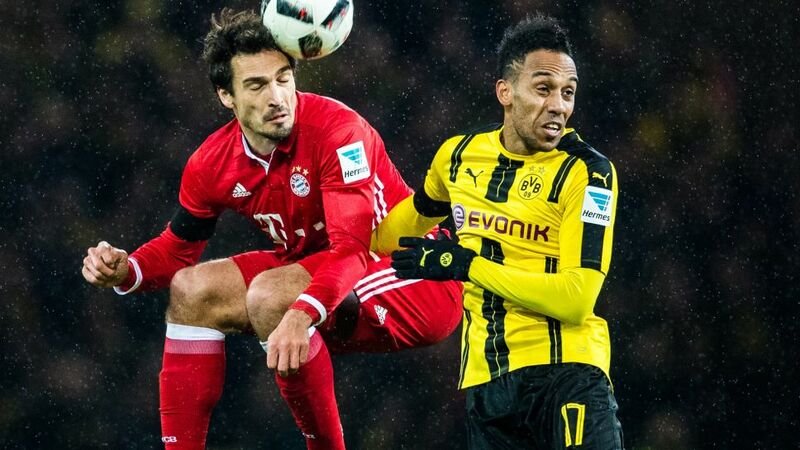 Pierre-Emerick Aubameyang decided matters as early as the 11th minute for BVB as defending champions Bayern suffered their first Bundesliga defeat of the Carlo Ancelotti era. Bragging rights on the Rhine reside with the Billy Goats after Marcel Risse’s brilliant free kick brought a pulsating derby to a dramatic conclusion. Gladbach were ahead before the break through Lars Stindl, but saves from Thomas Kessler to deny Thorgan Hazard, Mahmoud Dahoud and Ibrahima Traore would prove vital come the final whistle. Anthony Modeste was in the right place at the right time after the break, the ball cannoning in off the French striker following Jannik Vestergaard's headed clearance before Risse’s last-gasp winner clinched the three points for the visitors. Mainz saw off Freiburg in an entertaining clash at the OPEL Arena. The home side looked to be cruising through early goals from Niko Bungert and Yunus Malli, but Vincenzo Grifo gave Freiburg hope with a clever lob midway through the second half. Stefan Bell restored the two-goal advantage, but after Freiburg had fought back again through Nils Petersen, Karim Onisiwo sealed the deal for the Zero-Fivers deep into stoppage time. Defences held sway in a tight encounter, with Hertha’s USMNT defender John Brooks in imperious form. He denied Dong-Won Ji with a last-gasp interception in the opening minutes and marshaled a defence that earned a fifth clean sheet of the campaign. Augsburg were on the back foot for much of the second half, but held on for a precious points. Head right this way for the Talking Points from Matchday 11!